Hello and and a verrrry warm welcome to our latest photo slideshows on the web! These new films take a few minutes to buffer, but I hope you'll agree, they're worth the wee wait! Click the link above to view the shows. I'm hoping this website gives you a wee flavour of our "home from home" that we call Findlay's Fynd. Findlay is our static caravan sited rrrrrright on the bonnie bonnie banks of Loch Fyne in Argyllshire, Scotland. This part of the west coast was much enjoyed by Dave and myself during our misspent youths :-P Indeed we brought our trusty tent to these parts many times to camp out, fish, drink like fish ;-) and photograph the area. In May 2004, we decided we wanted to have something a bit more homely and weathertight ( but sadly still not any more midgie proof :-P as it turns out ) than the aforementioned trusty tent. We headed strrrraight to the west coast. When I clapped eyes on the view, I knew I had found my fynd!!! We were all instantly smitten ...not to mention subsequently and frequently midgie bitten :-P !!!!! We head up on Fridays to spend our weekends by the sea....always something we look forward to! The kids' school holidays are spent here at Findlay's, where we fish (well, I don't )swim in the loch ( errrrrr I don't do that either lol but I paddle if persuaded! ) the girls make new friends and we all plunder the beach and sea shore, especially Zoe whose crab hauls and beach tours are now infamous. In 2006 Dave bought a little inflatable dinghy to paddle around the bays in. We love to explore the local area finding new favourite haunts! The weather is pretty mixed....... well it IS Scotland ya know :-P .....but the scenery is always brrrrrreathtaking and we all are a bit browner!!! or click HERE to go see our video page, soon to be updated! In September 2005, the Fletcher clan became a little bigger, as Ralph, our Cavalier King Charles Spaniel joined our family and lit up our lives! 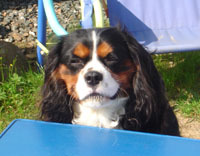 He is a typical happy, characterful cavalier who loves his life as an Argyll country gent! Dave has made some short films and I have made a couple of doggy-dedicated slideshows! And here they are! Click on Ralphie and enter Ralphweb!! The beauty of the place speaks for itself in the photos, , but the real beauty for me and all my lil clan is the atmosphere. Being a highland sea loch, which is tidal it can be sooooo tranquil and yet can suddenly change to be dramatic and sometimes a wee bit scary!! The pace of life sloooooows and everything can seem further away or harder to find (including petrol lol!) The air is so much fresher, the sky is bluer the stars brighter :-P .......it's a place to really unwind, enjoy and study the wildlife and the changing seasons together.....I dont think there's anywhere I would rather be! The thunderstorms ( 09/08/04 ) were amazing and destructive, in fact we were cut off for three days, because the Glasgow road was closed after some major landslides......luckily Dave was on holiday or he would have had a rather major detour to get to work!!!! All told whatever the weather we are all always loathed to leave! I'm sure once you have looked round some of the pics and short vids you might see why we just soooo LOVE school holidays and the weekends, and all of us count down the sleeps til Friday comes around again! PS ok, I hope to be good lol....and keep updating the site frequently with new pics, so feel free to pop back again soon to see our latest adventures in video and slideshow formats! Here's an article from the Press and Journal Dave and I found very amusing! Clicking here takes you to the Willerby site to see their interior shots of our caravan, The Winchester.